The botanical name is straightforward: Hosta 'Francee.' The former is the genus name, while 'Francee' is the cultivar name. Most gardeners flip the two words to form the common name (I do not italicize or capitalize "hosta" when using it as a common name). The plant is an herbaceous perennial. This hosta matures to 1-2 feet tall, with a slightly greater spread. Francee bears light lavender flowers during the summertime, but it is as a foliage plant that it has bragging rights. 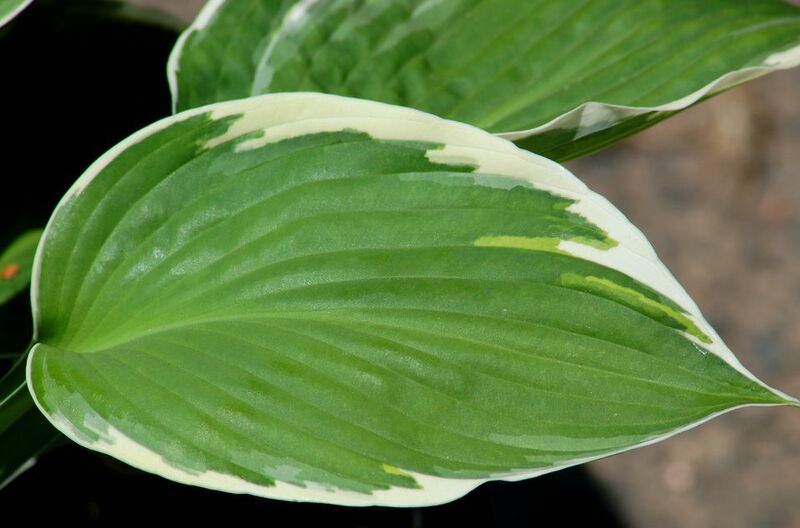 The leaves of this variegated plant have white margins with green centers and can attain a length of 8 inches. Hostas are known for their cold-hardiness, and this type is no exception. Its growing zones are listed as 3 to 9. Install it in a location where it will receive partial to full shade and where the soil drains well. The further north in its range you are, the more sunlight it can stand. While not overly demanding in terms of soil fertility, the plant is most likely to thrive in soils rich in humus. Regarding watering, Allan Armitage provides advice that all of us who have grown hostas can relate to, saying, "Keep plants consistently moist, or leaf margins become brown" (Armitage's Garden Perennials, Page 167). Spring and fall are both considered good times to divide this perennial, although more people find it easier to perform this job in spring. Unhappily, watering and dividing are minor care tasks compared to the hosta care that gardeners dread the most: namely, pest control. Creatures great and small esteem it as a gourmet salad green, and most of the hours of care you put into your hosta plants will consist in trying to outwit these pests. A small pest that delights in devouring hosta in my region (New England) is the slug (depending on where you live, you may have to do battle with a similar garden pest: snails). Don't underestimate the severity of the damage that these lowly pests can cause. I discuss some ways to kill slugs in my review of a book written on that subject. A great pest (great in size, that is) that presents a problem for hosta growers is the deer. You can try fencing deer out or driving them away with repellents, but if you have a really bad deer problem in your area, you may find it best to take the path of least resistance and simply grow deer-resistant plants, instead.